This book addresses the criminalisation of sexually explicit material depicting or describing fictitious characters who appear to be children. It is the first book of its kind to specifically examine the expansion of the law to include fictional representations of children, focusing on the law in Australia, Canada, the United Kingdom, and the United States. The author explores the potential criminalisation of comics and subgenres of manga that frequently depict childlike characters in a sexual context. Of course, the need to protect children from harm outweighs freedom of expression and the right to privacy; however, this argument is complicated by the material being purely fictional. Does prohibiting the fictional representation of minors interfere with individual freedoms? Based on a detailed socio-legal study, this book extensively analyses literature and pertinent theories of criminalisation, such as the Harm Principle, Offense Principle, and Legal Moralism. The book will be an invaluable resource for academics and students in various disciplines, including law, criminology, sociology, and psychology. It will also be of interest to fans of fantasy fiction. Dr Hadeel Al-Alosi is a lecturer at Western Sydney University and a lawyer in Australia. She has taught various subjects including criminal law, criminology, and legal research at reputable Australian universities. Hadeel has a strong interest and expertise in criminal justice issues. Her research interests focus on sensitive topics, in particular, child abuse material and domestic violence. 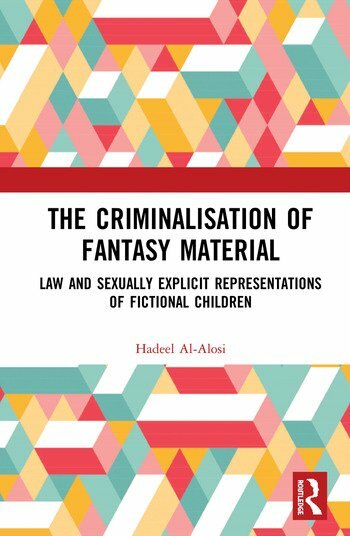 "Al-Alosi presents a thought-provoking, timely, eloquent and detailed examination of the criminalisation of fantasy material. I'd recommend this book to anyone with an interest in the immediate concern of child exploitation and the question of how we interpret and set the limits of individual human ‘rights’ when faced with the need to protect those who may be harmed". Associate Professor Dr Tony Krone, University of Canberra (Australia). "This book provides a thought-provoking examination of the contemporary regulation of sexually explicit representations of children. Al-Alosi presents a nuanced analysis that thoroughly challenges the ways in which we approach the regulation of explicit material and understand its harms, or lack thereof. This book unsettled my own thinking around the issue and provides timely, original, and provocative contribution". Dr Bianca Fileborn, School of Social Sciences, University of New South Wales. Based on a comprehensive analysis of fantasy crime, this book asks fundamental questions about how we conceive of, and prosecute, sexually explicit material portraying children. This thought-provoking work provides a substantial contribution to the debate.